Regular listening to IELTS-type test materials is an absolutely essential. There are a number of strategies and tips you can use to help to maximise your efficiency during the test. Here are a number of tips on how to approach the IELTS listening Test. 1- Read the instructions and questions carefully before you listen. Try to get an idea of the situation. Who are the speakers? Where are they? Why are they speaking? Remember, you will only hear the audio once. You will need to read, write and listen all at the same time. 2- At the beginning of each section read the questions for that section carefully, before the recording starts. This will help you to follow the recording and identify the answers. Listen carefully for clues as to which stage of the recording you are listening to, e.g. words such as ‘firstly’, ‘my next point’, ‘to sum up’. These words will help you identify which question you have reached. 3- If you can predict the sort of things you are going to listen for during the listening test, you can reduce the amount you need to listen to. At the beginning the IELTS Test there is a 2.5 minute introduction. Use this time to read through the IELTS listening test booklet and try to get a general understanding of what the sections are going to be about – even this simple type of prediction will help you. As you scan through the booklet, look for maps, charts or illustrations – these often give you a good idea of what the topic of a section is going to be about. 4- After each section you are given one minute to check your answers. But how will you able to check your answers if you can’t listen to the tape again? We advise you to use this time to scan and get an idea of what the next set of questions are going to be about. 5- Sometimes you are asked to complete a table or a chart using information on the tape. It’s natural to think that answers will be left-to-right and the answers on the tape will be one after another. However, this might not be the case you may need to write answers horizontally or in other order. Check carefully how you are going to answer such questions to avoid putting the right answers in the wrong places! 6- When you are listening to the tape, try to read two questions at a time – you might find that the answers to both questions are in a single sentence. 7- If you don’t catch the answer to a question, it’s natural to think hard to try to remember the answer. If you do this, you will miss parts of the tape and possibly won’t be able to answer other questions. When you miss the answer to a question, forget it – go onto the next question. Remember – you only listen to the tape once. The answer might be repeated on the tape anyway. 8- If you miss the answer to two or three questions, again, miss them out – you won’t be able to remember the answers. 9- If you get to the stage where you are totally lost, you may have to wait until the other candidates turn their pages before you can find out where you are in the questions. Of course, this is not ideal but if you have to do this, don’t panic because if you do you will have even bigger problems. If you look at the grammar of the sentence it might help you get the answer. The verb ‘were’ would suggest a plural noun. How many plural nouns are there in the answers? Only two… ‘People’ and ‘Children’. Now you have a good idea of the possible answers, you can use the tape to check for which answer is correct. 11- If you miss some questions out, you will leave gaps in your answer sheet. Take special care to write your answers in the right order. When you miss questions out, it can be easy to start writing questions out of sequence. Check now and again just to make sure you are writing answers down in the right place. 12- Remember that you are probably not going to hear the same words in the question and in the answer. IELTS questions usually involve ‘paraphrasing’- using a sentence with the same meaning but not using the same words. 13- You should listen for keywords this is quite important, but you should also listen for ‘synonyms’. 14- You are answering a multiple-choice question and you miss the answer. One of the choices is ‘None of the above’ or ‘All of the above’. If you really don’t know the answer, choose these answers – they are likely to be the right because they might not be in the list otherwise. Although next year may be 2015, this is not the right answer. On the tape it said next year. 16- Many IELTS questions involve listening to numbers and quantities. However, in natural speech the difference between ‘16%’ and ‘60%’ is often difficult to hear if you haven’t practiced. 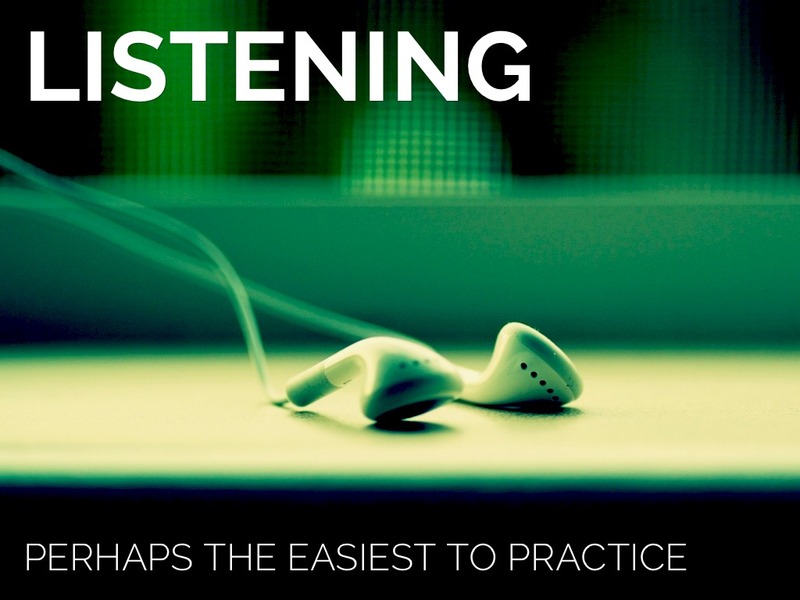 Get used to listening to numbers – the only way you can do this is get some listening material and keep practicing! You might be listening for the name of a person, but it could also be referring to a member of your family (e.g. ‘my mum’) or even a profession (e.g. ‘the doctor’, ‘my teacher’). Take some time out to write down as many question words as you can and think of everything they could refer to. You might get some surprising answers. However, if you wrote this, it would be correct: ‘MICHAEL SMITH’. If you are unsure of punctuation or you don’t know if something might have a particular punctuation, write everything in capitals. There is no penalty for writing answers in the listening test in capital letters. 19- If you are answering a Multiple Choice question that involves a number of sentences or text and you miss the answer, choose the longest answer. The answer is probably going to be a paraphrase of another sentence and that means it will probably be longer. 20- Practice listening to something every day. There are many sources: watch an English language movie, listen to songs etc. All you need is commitment to sit down and practice!